Whether you’re a property owner or a business owner within a commercial property, you share the common goal of wanting to attract more people to your facility. Thankfully, there are things you can do to make your property more attractive to tenants and visitors without needing to undertake a full remodel or renovation. In particular, adding a monument sign is an affordable and custom solution that can make your property more attractive to present and future tenants, and attract customers and visitors too. We’ve come a long way in terms of wayfinding technology. Most people have GPS-equipped phones that can help them locate everything they need. But even with a map in your hand, for people driving in cars, or even walking in a new part of town, there is nothing more frustrating and unwelcoming than struggling to find a particular location. Today’s technology doesn’t change the fact that installing monument signs in Denver is a wise decision, and one that will help you grow your business. If you always want your building or plaza to be easily found, the solution lies in the form of a monument sign. A monument sign is a freestanding outdoor sign that can list all the names of the businesses within a building or simply be used by one particular business. 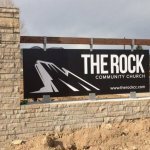 In addition to being a very functional sign, monument signs in Denver can reinforce the professionalism and quality of your property. And since they can be designed in almost any way, you can create a custom monument sign that captures the feel or branding of your property. When you invest in quality, professional signage, prospective tenants will assume that the overall property is well taken care of. That’s a very compelling reason for someone to decide to run their business in your space! When the property already has effective signage, prospective tenants will know that making sure the facility is well known to the community is a priority. A building that is easier to find results in greater customer traffic, which can turn into greater sales for tenants and their businesses. When you build a monument sign that sticks out in a positive way, you’ll become a fixture in your community. When your company sign is used as landmark when giving directions, you know your business is being talked about, and that’s certainly not a bad thing! Monument signs for business get seen by the thousands of cars that drive by your building every day. If you could turn even a small percentage of those people into customers, you’d most definitely improve your sales. A monument sign can help boost your company’s overall visibility, so that when consumers need the product or service you provide, you’re the first solution that comes to mind. Whatever your business goals, Magnify Signs is here to help you grow. Contact us and tell us more about your business so we can share signage design options that meet your needs. From making sure commercial spaces are always leased to driving more traffic into your buildings, monument signs and other types of commercial signage can make a significant difference in how your community views your business. Email or call us at 303-761-9592 to arrange a complimentary consultation.